One of Disney’s biggest draws for tourists is the offering of character dining within the parks. Walt Disney World has more than enough, and now Disneyland is adding two more opportunities to dine with your favorite characters. This summer, Storytellers Café at Disney’s Grand Californian Hotel & Spa and Disney’s PCH Grill at Disney’s Paradise Pier hotel are adding character dining experiences. At Storyteller’s Cafe, join Mickey and pals for Mickey’s Tales of Adventures. Here, you’ll “discover the fun” with your storyteller, Mickey, as he welcomes you into the immersive tales of adventure through his magical Adventurer’s Journal. At Disney’s PCH Grill, you’ll join in on some beach fun with Donald Duck’s Seaside Breakfast. Donald has been reunited with his true love, Daisy, and you’ll be able to join in on their exciting rendezvous with a dance party featuring the two love-birds and Stitch while chowing down on an all-you-can eat breakfast buffet! Reservations are not open yet for either dining experience but will be soon. We’ll have that info for you when it becomes available! Also available at Storytellers Café, Avocado Toast and Kale Salad have been added to the menu. 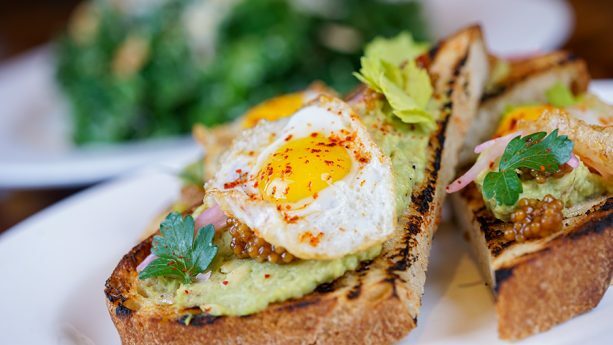 The Avocado Toast comes with crushed avocado, lemon-olive oil, parsley, celery leaves, quail eggs, and Espellete pepper on top of a slice of grilled sourdough bread. The Kale Salad has almonds, currants, Grans Padano, bacon-bread crumbs, and garlic vinaigrette. Also for lunch, try the new ‘Nduja Sausage and Margherita Artisanal Pizzas. 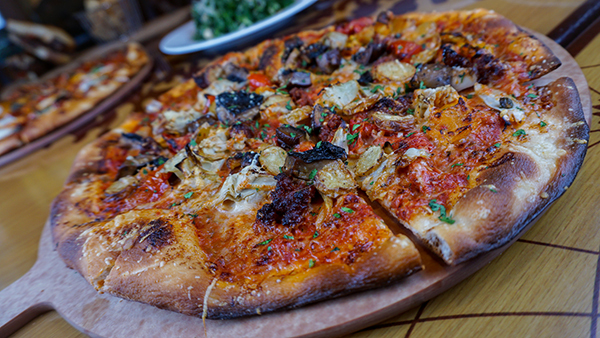 ‘Nduja Sausage is topped with ‘nduja sausage, mushrooms, artichokes, and potatoes. 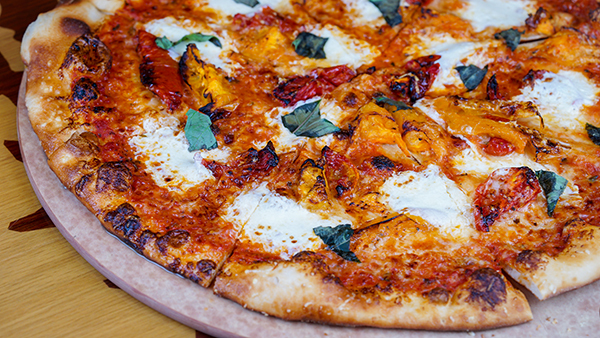 The Margherita Pizza comes with fresh mozzarella and basil. Both include Grans Padano, fire-roasted tomatoes, and aged provolone cheese. Chicken Paillard and Braised Boneless Short Rib are specific to the dinner menu. The Chicken Paillard is a lightly-breaded chicken breast with roasted potatoes and heirloom carrots, and topped with a lemon-caper sauce. The Braised Boneless Short Rib is paired with mashed potatoes, creamy horseradish, and Brussels sprouts. 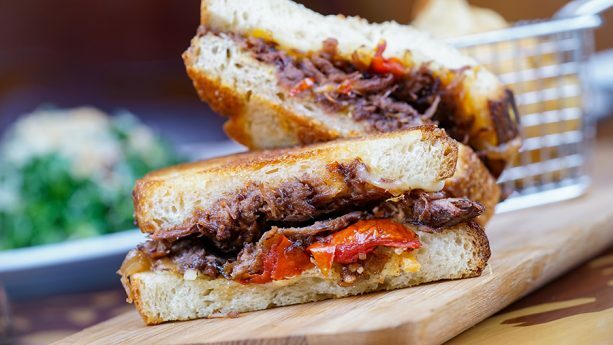 Along the lines of short rib, also on the lunch menu is the Short Rib Grilled Cheese on sourdough bread with cheddar cheese and caramelized onions. For dessert, enjoy the Vanilla Crème Brûlée, served with orange-vanilla biscotti and marinated raspberries. We haven’t forgotten about you, Paradise Pier Hotel. Here, you can Build- Your-Own Poke Bowl at the Surfside Lounge and Sand Bar! This dish comes with avocado, cucumber, and red and green onions. Customize your bowl with choices of base, protein, and sauce. The base includes white rice, brown rice, or romaine leaves and proteins include tuna, salmon, or tofu. All the proteins or marinated in a ponzu sauce. 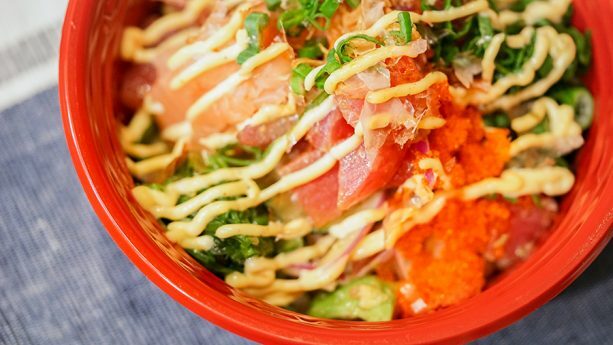 For the sauce topping, choose from spicy mayo, poke sauce, or wasabi. Each bowl will be garnished with seaweed wakame, tobiko caviar, fried onions, pickled ginger, bonito flakes, and sesame seeds. There’s a million different ways to try this! Right next door at Disneyland Hotel, Trader Sam’s Enchanted Tiki Bar, Tangaroa Terrace, and the Poolside Bar have also updated their menus. One of these new items is a Island-Style Hot Dog, which is ground pork and pineapple sausage in a pretzel bun and topped with whole-grain mustard, onion sauce, pickled carrots, daikon, and Fresno chiles. A Chicken Teriyaki Bowl features diced chicken breast on a bed of rice and veggies topped with teriyaki sauce and togarashi aïoli, wonton chips and sesame seeds is also available. Last, but not least, try the Rongo Salad made up of shredded green papaya, fresh lettuce, marinated tofu, cucumber, gooseberries, rice noodles and carrots tossed in a sesame-ginger vinaigrette! With all these options, you will certainly won’t go hungry at the Disneyland Resort Hotels! What will you be trying? Do they still do the Goofy’s Kitchen breakfast at Disneyland Hotel? Also, do you think Paradise Pier Hotel will eventually change their name since Paradise Pier is renamed and rethemed at DCA?